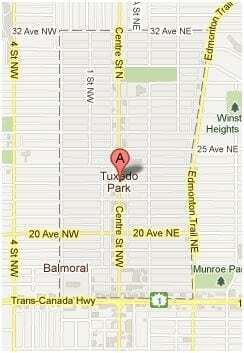 Tuxedo is an inner city community in the northeast quadrant of Calgary, found between the Trans-Canada Highway and 32nd Avenue NE. A combination of older homes and great inner city location has given way to the construction of new Calgary infill homes in the area. Tuxedo residents have great access to a wide range of amenities and services located on Centre Street, 16th and 2nd Avenue NW / NE and as well as Edmonton Trail, plus a variety of recreational opportunity provided by a number of nearby pathway and parks. Beautiful new infill homes, great location and great main route / amenities access are but only a few benefits of inner city living in Tuxedo, Calgary. Four main routes that are home to multiple businesses border and split Tuxedo including Centre Street North, Trans-Canada Highway, Edmonton Trail NE and 32nd Avenue NE. A vast range of businesses can be found on these routes near Tuxedo including Home Depot, Co-op, Safeway, Lina’s Italian Market, CIBC, multiple strip malls, professional buildings and more. Tuxedo living ix convenient because the community is far enough outside of downtown to not be hassled by traffic during rush hour, but is less than three kilometres from the heart of downtown. Nearby Confederation Park plus a couple other smaller recreational areas provide Tuxedo with lots of recreational opportunities. The Bow River parkway is approximately a fifteen minute walk from the centre of Tuxedo that is great for spring, summer and even fall activities. Tuxedo Park surprisingly has 3 different elementary school designations including Buchanan Elementary, Mount View Elementary and Rosemont Elementary. Rosemont Elementary has public transportation provided for students because of its further proximity from Tuxedo. Junior High school designation is Georges P. Vanier for grades seven to nine, while James Fowler and Crescent Heights are the high school designations for grades ten to twelve. Tuxedo offers parents lots of options when choosing which school to send their child(s) to. Options are always great and are better to have than none what-so-ever. St. Paul Elementary School is a privatized Catholic school in the area as well. Calgary Transit has many bus routes that commute on a number of roads bordering / in Tuxedo. Access to downtown via Centre Street North is less than five minutes and with such a plentiful amount of stops and routes on Centre Street, getting to the downtown LRT terminal is efficient. Other bus routes on Edmonton Trail NE, Trans-Canada Highway and 32nd Avenue NE also exist. Routes in or near Tuxedo include Huntington, Deerfoot Centre, North Hill, 16th Avenue North, Elbow Drive and Sandstone, Panorama, BRT for North and West, MacEwan, Rosedale East Calgary, Circle Routes, Renfrew and Spruce Cliff, Northland and Sunridge. Getting around is easy when living in Tuxedo. Questions about Calgary Inner City Infills? Contact me directly at 403-370-4180 anytime! I am very much looking forward to helping you achieve your real-estate goals. Listed by THE REAL ESTATE COMPANY and CENTURY 21 BAMBER REALTY LTD. Enter your email address to receive Inner City Buyers Tips and receive a FREE eBook on Inner City Real Estate. His care and dedication greatly exceeded what I had expected from a Realtor and I'm very thankful for all his help.